Episode 69 is here. And guess what? Katie Pavlich is back. Her trip was canceled due to the April blizzard striking the western part of the country. So, what better story to begin the podcast than discussing Attorney General William Barr saying that the Trump campaign was spied on during the 2016 election? Yeah, that happened. Cue the meltdowns from Democrats who wondered if the AG misspoke. Barr was stone cold in his affirmation, however. He’s assembling a team to investigate the matter. It’s our turn to air some dirty Democrat laundry. Ilhan Omar stepped on a rake again, saying that the 9/11 terrorist attack was an event where “some people did something.” She marginalized and downplayed the attack that left nearly 3,000 Americans dead at a CAIR event last month. 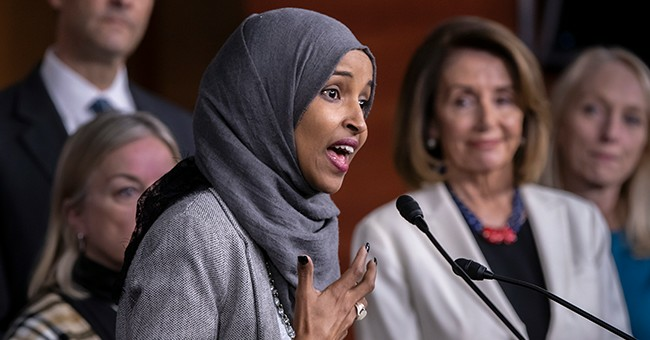 This is on top of the various anti-Semitic antics she’s partaken in over the past few weeks; Pelosi defended these incidents by pretty much saying that Omar was too dumb to know what she was saying. Omar has lived here for over a quarter century. She’s a refugee. She’s been educated here. And she’s been elected to the House. And this is how she treats one of the most vicious attacks against our country? Katie nailed it: she’s just an ungrateful immigrant, maybe the most ungrateful. Now, a person who's feeling grateful is Benjamin Netanyahu, who clinched his fifth win in the recent Israeli elections. He’s feeling good. Wikileaks’ Julian Assange, on the other hand, isn’t, after being arrested as Ecuador revoked his asylum protections. The London police dragged Assange out of the embassy today, and it looks like he needs some time in the sun. Back at home, Fairfax County, Virginia is mulling establishing an illegal alien defense fund subsidized by taxpayers to fight ICE deportations. That means MS-13 gets a nice taxpayer-funded defense, which is wholly unnecessary as public defenders are already provided to these people. No funds for illegals—period. Ken Starr, the independent counsel who investigated the Clintons, said that there was one detail he left out of his final report: Hillary’s ripping of then-Deputy White House Counsel Vince Foster “triggered” his suicide in 1993. Foster was already depressed and suffered a panic attack after the failed Zoe Baird AG nomination. Starr said he left that detail out to pretty much avoid hurting Hillary’s feelings. In media nutjob land, CNN’s Jeffrey Toobin suggested that Fox News was running the DOJ…because AG Barr watches the network. All I can say is…cocaine is a helluva drug. And speaking of drugs, you had to be on them to even think that Trump would release his tax returns on the Democrats’ total BS timeline. Treasury Secretary Steve Mnuchin said that those documents wouldn’t be released by the deadline, so House Democrats and the Trump White House have another war to fight.